Posted on 2017-10-17 07:00:33 GMT+0000 by Neil Godfrey. 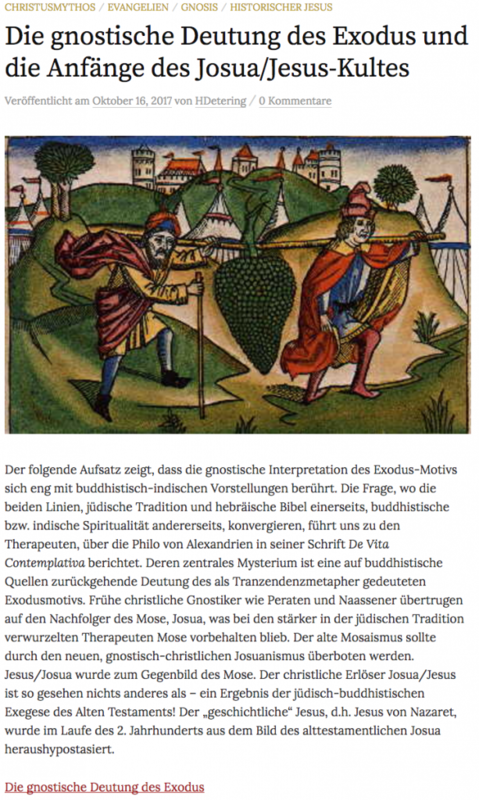 This entry was posted in Biblical Studies, Christian Origins and tagged Christ Myth Hypothesis, Hermann Detering. Bookmark the permalink. The Buddhist references found by Detering correspond in some way to my thesis that suggests a fusion between the Therapists of Alessandria and a sect of Tantric Buddhists coming from India. In my last work, unfortunately only in Italian, the Marble Code, there is a precise hypothesis about the derivation of Gnostic Christianity from this fusion, whose traces are still detectable in the Gospel of Thomas. The Buddhist connection is an interesting hypothesis. One can well understand the reluctance of many scholars to explore possible connections with Christianity, so it will be interesting to see what Hermann Detering has to say and to see what earlier studies he cites. I look forward to comparing that information with yours. I look for the Detering’s hypothesis and in the meantime I will try to prepare a summary in English language of the elements that support a tantric connection that transformed a primitive Egyptian essene sect into a therapist. Starting with the Gnostic interpretation of the Exodus motive and the question of its religio-historical origin, we arrived at the pivotal importance of the image of the „the further shore“ as a metaphor for transcendence, that plays an significant part in Indian/Buddhist spirituality. The question of where the two lines – Jewish tradition and Hebrew Bible on one hand, Buddhist or Indian spirituality on the other – converge, led us to the Therapeutae, about whom Philo of Alexandria writes in his work De Vita Contemplativa. Having made to look plausible a Buddhist origin of the Therapeutae, it was possible to show that their main mystery is based on an interpretation of the Exodus motive that goes back to Buddhist sources. At the same time, that interpretation contains the germ of the Christian sacrament of baptism. Early Christian gnostics like Perates and Naassenes transferred onto Moses‘ successor Josua what the Therapeutae, more deeply rooted in Jewish tradition, preserved for Moses himself. The old Mosaism was meant to be surpassed by the new, Gnostic-Christian Josuanism. Jesus/Josua became the counterpart of Moses. In this light, the Christian redeemer Josua/Jesus is nothing more than – a result of Jewish-Buddhist exegesis of the Old Testament! The „historical“ jesus, i.e. Jesus of Nazareth, was hypostasized from the Josua of the Old Testament in the course of the second century. I’m sorry, my text editor changed every “of the” into “oft he”, and I didn’t realize it every time to change it back. Maybe a native English speaker might polish up my translation, so it can be posted in Neil’s original article. Addenda/Corrigenda: by reading Detering’s article, I realized that “das andere Ufer” refers to the title of a book by Henri Le Saux, so it might be better to translate it accordingly as “the further shore” (not as the “opposite bank” as I did before). Yours is still better than the Bing translator.